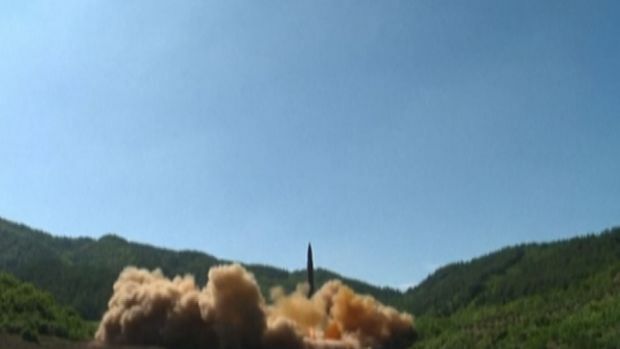 Amid rising tensions between the United States and North Korea, Senator Tammy Duckworth shared a message Thursday for President Donald Trump: You can’t "out-crazy Kim Jong Un." 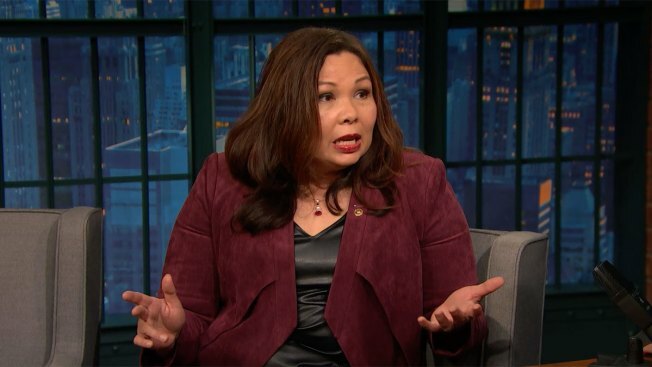 "You can’t out-hyperbole a dictator who’s crazy, a man who executed his own uncle with an anti-aircraft machine gun," Duckworth said, referring to the 2013 execution of Jang Song-thaek, during an appearance on "Late Night with Seth Meyers." "Trump is not gonna out-crazy Kim Jong Un," the Illinois Democrat continued. "Stop it. You’re the commander in chief of the greatest military on Earth – act like it." Duckworth was referring to Trump’s Tuesday warning that North Korea would "be met with fire and fury like the world has never seen," a threat he said Thursday maybe "wasn’t tough enough" after North Korea announced plans to send a salvo of ballistic missiles close to Guam, a U.S. military hub in the Pacific. Calling the escalating threats a "battle of terminology," Duckworth – a retired U.S. Army Lieutenant Colonel who was awarded a Purple Heart for her service in Iraq – said that Trump is "not helping us by engaging." "You have to understand that Kim Jong Un is trying to consolidate power and one of the ways he’s doing that is by executing anybody who doesn’t please him," she elaborated. "The other is to tell the North Korean people, 'You're starving but it's because the world wants to attack us, so I have to take the money that, instead of giving you rice, I’m gonna use it to build a nuclear weapon.'" "And when you’ve got the leader of the free world, the president of the United States, engaging in this, all you're doing is you're just writing the propaganda for Kim Jong Un," Duckworth added. "All of those tweets that Trump has been putting out in these statements, Kim Jong Un is going to put out through his own propaganda machine. He might as well be working for him. That doesn’t help us." Duckworth also discussed Trump’s July announcement on Twitter that the U.S. military would no longer allow transgender individuals to serve "in any capacity." "If you are trans then you’re gonna have two choices: either quit and take your experience with you, or hide who you are and make yourself susceptible to blackmail," she said. "That’s what happened under Don’t Ask Don’t Tell. Under Don’t Ask Don’t Tell, a lot of folks were actually being held hostage by people who knew that they were gay and threatened them and threatened their careers, so that’s not helpful." "We have tens of thousands of trans service men and women who’ve served honorably, who’ve bled, who’ve died for this country, and to turn away people who are willing to sacrifice for us is foolish at best," she said to applause from the audience. Duckworth, who served two terms in the U.S. House of Representatives before being elected to the Senate in 2016, lost both legs and partial use of her right arm in 2004 when the Black Hawk helicopter she was co-piloting was hit by a grenade in Iraq.